As thousands of responsible British motorists fit Winter Tyres to their cars, they are finding that some insurers are loading their premiums by as much as 20% (Direct Line - reader report). "This is plainly either brain dead, or ruthless profiteering," write Honest John. "Winter Tyres are a legal requirement in Austria from November to March and must be fitted in Germany whenever snow is on the ground." "This seems to me to be yet another way in which the Private Equity Firms that now own many car insurers and brokers are exploiting the compulsory legal requirement for drivers to have insurance and to disclose any 'modifications' to their cars." "The Credit Hire scandal in which some insurers and many brokers are complicit has already been exposed. As soon as a driver is involved in a crash he is approached by an 'Accident Management' specialist who offers to put him in an equivalent hire car and take care of the repair. What the driver does not realise is that the hire car will be at an inflated premium, the repair may be delayed to extend the period of car hire and that the driver himself will be liable for the car hire charge if insurers refuse to pay." "My readers insurers have been hit with bills of £27,000, £33,000 and £40,000 for cars provided for them while their cars were being repaired. Some readers, involved in crashes as much as two years previously have been directly hit with credit hire bills for the other party's credit hire car that the insurers recused to pay." "The huge recent increases in insurance premiums are a direct result of this type of legal exploitation. Hitting motorists for a 20% increase in premium for making their cars safe in the winter is yet another example"
"Government has not stepped in to stop this either because it is too stupid to realise what is going on or because civil servants and politicians are involved in this exploitation of the public." "We now need to see the insurers who do not exploit their policyholders in this way stand up and be counted so that drivers can switch their policies to insurers who do not rip them off." So far (by 6th December 2010), the list of insurers who do not hike premiums for fitting Winter Tyres include: Fortis, Sun Alliance. Following a report in this week's Auto Express magazine, TyreSafe, the UK's leading tyre safety organisation, is concerned and disappointed at reported additional premiums being charged by some insurers for drivers fitting winter tyres. 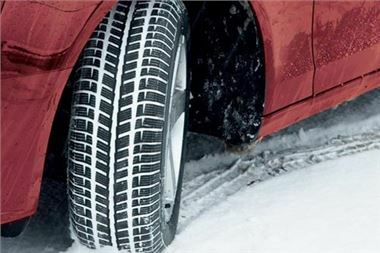 The magazine claims that some insurers regard the fitting of winter tyres as a vehicle modification, resulting in high insurance premiums for drivers. TyreSafe's criticism has also been echoed by industry bodies RoadSafe and the NTDA. "Many independent tests have proven that winter weather tyres are the safest option for drivers throughout the entire winter period, not just when we have snowfall and ice," explains Stuart Jackson, chairman, TyreSafe. "To penalise drivers for taking a positive step to improve their safety on the road seems absurd. With the high number of drivers still being killed or injured in tyre related accidents each year, we should be actively encouraging responsible behaviour, such as the fitting of winter tyres." Winter weather tyres can be used all year round but their performance is notably better when temperatures fall below seven degrees Celsius. In these conditions 'standard' tyres begin to harden and lose their ability to grip the road surface properly. Winter weather tyres contain more natural rubber and advanced silica compounds to reduce the hardening process and improve grip. Tests conducted by the British Tyre Manufacturers Association found that a car braking at 60mph on a wet road at five degrees Celsius stopped five metres shorter, equivalent to more than one car length, when fitted with winter weather tyres. Drivers who decide not to fit winter weather tyres should still carry out a number of checks to reduce their chances of being involved in an accident. Tread depth should be checked to ensure that it easily exceeds the legal minimum requirements of 1.6mm across the central three quarters of the tyre, around its entire circumference. Tyre pressures should be checked at least once a month or before a long journey and the tyre should be inspected for any cuts, bulges or embedded objects. To help drivers further understand the benefits of winter weather tyres, TyreSafe has added a new dedicated section to its website along with an updated information leaflet which can be downloaded free of charge. To see the information visit www.tyresafe.org. Tyres approved by both car and tyre manufacturers for winter are sometimes of a lower speed rating than the standard tyres as they tend to run warmer owing to their special winter compound. This lower rating is appropriate for winter conditions. For example, the winter tyre fitment for a vehicle equipped with a "V" rated summer tyre (for sustained speeds of up to 150 mph) might be "H" rated (up to130 mph, almost double the UK national speed limit) in the equivalent winter pattern. TyreSafe is a not-for-profit organisation dedicated to raising awareness of the importance of the dangers of defective and worn tyres. In 2009, TyreSafe was awarded with the Prince Michael International Road Safety Award in recognition of its achievements in raising awareness about the dangers associated with driving on defective and worn tyres.